All levels and styles of acoustic players are welcome. This jam has been on-going for several years and has a healthy attendance by a bunch of great folks. Thanks to Matthew Nord of Tangled Tones Music Studio for providing a bluegrass friendly location for this weekly jam. 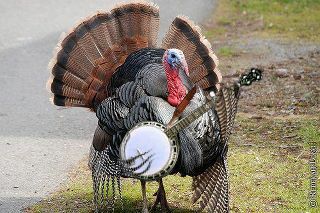 You’re invited to a Thanksgiving Weekend Bluegrass jam and potluck. 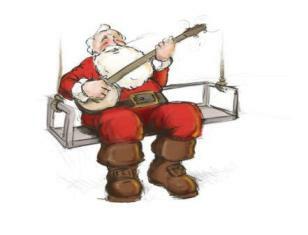 The Ruby Jewel Jamboree is excited to announce that we will be booking bluegrass shows in 2014 in Billings, Montana. Phyllis & Kimberlee will be in Billings over the weekend and will host a bluegrass jam and potluck. We’d like to get to know you if you’re a picker or a grinner. The Tangled Tones Jam which usually happens every Wednesday is canceled THIS WEEK ONLY (Nov 27). We’re all busy preparing for Thanksgiving tomorrow. Please join us for this bluegrass jam which has been moved to Wednesdays. We’re going back to weekly jams now as we move into the fall. All levels and styles of bluegrass are welcome. 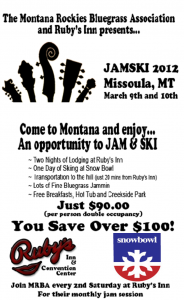 Join us for a day of skiing and pickin’ the bluegrass music. Skiers meet at the bottom of Griz at 9:30 if you want to ski together. Otherwise look for us on the hill. I’ll be wearing bright green ski jacket and red helmet. 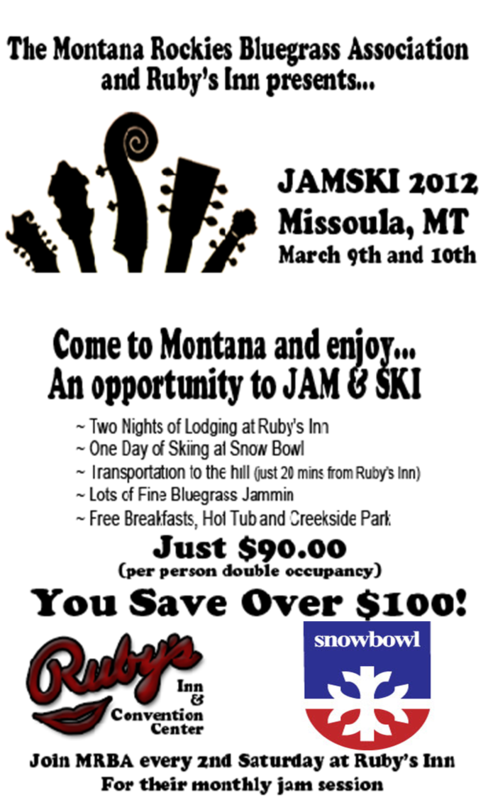 Join us for a day of skiing at Snowbowl and a night of pickin’ the bluegrass music at Ruby’s. Hi Folks, Thanks so much for attending and participating MRBA’s slow pitch jam, you all are great! We were happy (again) for the super turnout. 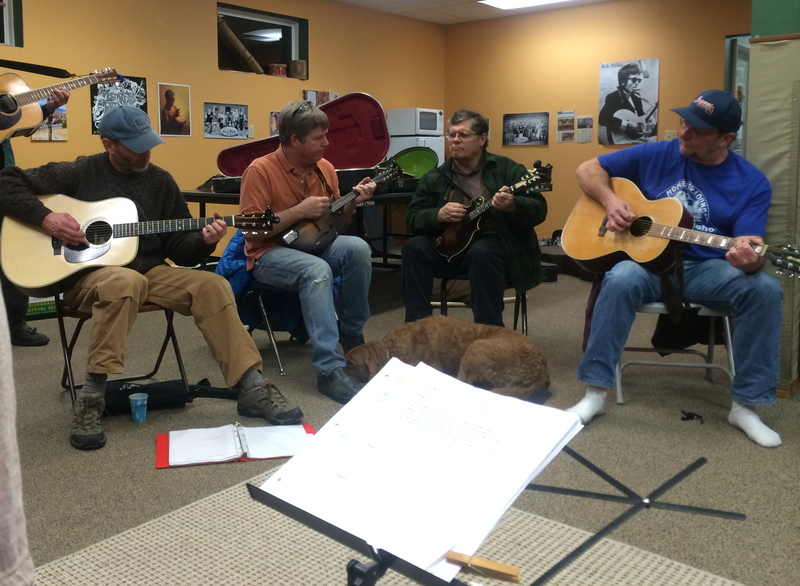 Our goal is to get LOTS more people playing live bluegrass here in Missoula. I had a chance to jam with some of you after the slow pitch and I know you guys rock (or grass)! The last jam in our winter jam series is at Ruby’s Sat March 10 same times (Meet and Greet at 2:00pm, Slow pitch at 3:00pm, Potluck 5:30, Jamming into the night). Please come, and invite a friend or two, and stick around for good food and more jamming. Our spring festival will be Sat April 14th at Lone Rock School near Stevensville. Bands will play every half hour from noon to 10pm and there will be lots of jamming going on all day and into the night. For those of you who like to have practice material, this was our song list from Sat, we changed some things on the fly but it should be pretty close. Most of our songs came from Sue Malcolm slow pitch instructional books and CD’s. These are not required for our MRBA jams but they are available for purchase from http://www.slowpitchjam.com/. These books are packed full of standards songs that would be welcomed at any bluegrass jam. Don’t forget the Ruby’s Jam this Saturday 2pm-? Come out and meet other pickers and grinners . A good time is always had by all!